I do like me some time travel books. And a time travel story where objects and people are brought into other times, and you have to go. . . . back to the future? Great Scott, sign me up! Seriously though, I’m a sucker for a good time travel. That movie Looper? It made no sense and all, and I loved it. 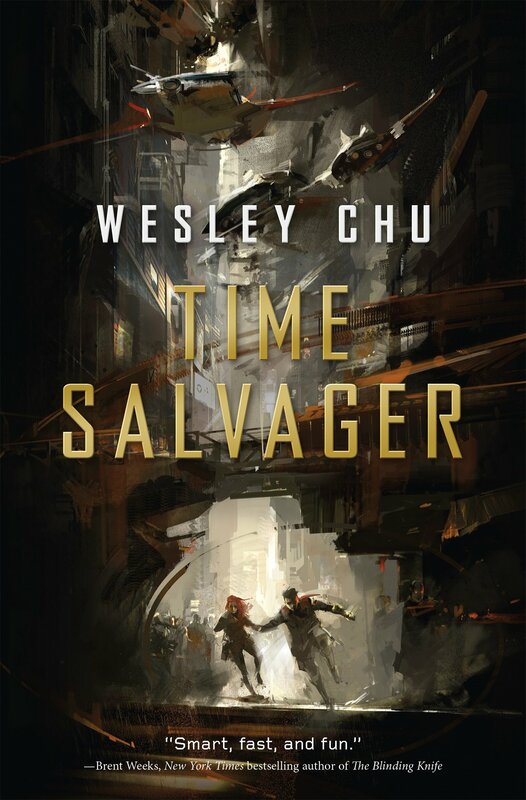 So, it makes sense that Wesley Chu’s Time Salvager would be right up my alley. The gist of the plot is in a few hundred years, Earth is in shambles. Chronmen go into the past to get resources, batteries, energy sources, valuable minerals, just about anything that’s worth anything. ChronoCom uses the time travel technology to give Earth a few more years of existence. Anyone who can afford to left Earth long ago to live on a colony elsewhere. Chronman James Griffin-Mars self medicates his way through too many dangerous missions. He’s left too many ghosts behind, too many people he couldn’t save, too many people he had to let die, because the history books said they died. You can’t rewrite history, you can’t change the future, everyone knows that. When James brings a woman back into the future, he breaks every law of time travel, and he seals his own fate as a traitor to everything he thought he believed in. Cinematic action sequences and high octane pacing, this sounds pretty intense, right?